Cet appartement luxueux est dans la Via dei Cappellari à quelques pas de Campo de 'Fiori et Piazza Navona, au coeur du centre historique. L'appartement est situé au premier étage d'un ancien palais des 1500s. 1er étage, une chambre double, une cuisine entièrement équipée, une salle à manger, un salon avec canapé et TV, une grande salle de bains avec baignoire et douche. 2ème étage, une chambre double, une chambre avec deux lits simples qui peuvent être joints et devenir un lit double, une salle de bains avec douche. Le mobilier de haute qualité, les planchers "Cotto Toscano" et les plafonds avec poutres apparentes donnent la touche finale élégante cet élégant appartement. TRANSPORT DE L'AÉROPORT: Nous organisons le transfert de l'aéroport à l'appartement pour l'arrivée facile et le stress en évitant. Service de concierge personnel: A votre arrivée vous serez accueillis par Mme Alessia qui vous fournira les clés, les cartes et l'orientation générale. Les demandes spéciales peuvent également être satisfaits. Service de nettoyage peut être organisé pour un taux horaire. SERVICE DE GUIDE: Lors de la réservation, vous pouvez également organiser une variété d'excursions avec un, anglophone, guide privé autorisé. Overall, apartment was dark. Windows faced sides of buildings offering no views and no natural light. Lights in the bedrooms upstairs were extremely dim. Ceilings on the 2nd floor were very low and dangerous. If you forgot to walk hunched from the upstairs bedroom to the hallway, you would hit your head (this happened on more than one occasion to members in our group). Kitchen was very small and could barely fit one person. It was very dated, not well kept and we did not use it. Upstairs bathroom had mold in the shower and on the ceiling. Upstairs bed cover had a stain which was bothersome. The apartment lacked decent chairs to sit on and it is in need of mirrors. Location was perfect. We walked to everything. We did not lodge any complaints with the owner or manager as we were only there for a few days and did not want the apartment to consume us. very nice apartment with great location, and the Luigi is super helpful - much appreciate everything ! Perfect location! We just returned from a 4-night stay in this lovely apartment. The photos do not do it justice. It is very spacious ...accommodating a family of 7. The kitchen is tiny...but we did not cook ...so it worked out perfectly for us. The owner, Luigi, quickly responded to any questions during the booking process and after. The property manager...Alessia...was a delight, answering any and lol questions. Location ! Wow. I cannot say enough about the location. We walked to all major sights...never had to take a metro or bus. I have to admit it was a LOT of walking...but we did it. We had to burn off those calories somehow from all that delicious food and gelato. 😊򒠠There are so many wonderful restaurants and gelaterias in the neighborhood! We would definitely return to this place. Disappointing experience of this property - unfortunately, the photos were not representative as property is much more dimly lit, and narrower, than in the photos. The location is the main attraction, as it is in the centre of the historical centro storico. Key issue for us was a very small & outdated kitchen, not suitable for a modern rental of a self-catering apartment for 6 people. The apartment had also not been properly cleaned for our arrival, with a layer of dust over much of the furniture. Poorly equipped kitchen overall in terms of cups, cooking equipment, etc, plus no toaster, no microwave, the washing machine was broken, & a broken door on the fridge made it difficult to open & close. The upstairs bathroom was also a problem to use, as it has a broken door which does not close; the upstairs shower also had mould and had not been properly cleaned. The upstairs closet area for the ground floor bedroom was being used to store broken wood and items of broken furniture, so could not be used. There was nowhere available in any bedroom to hang up clothes. 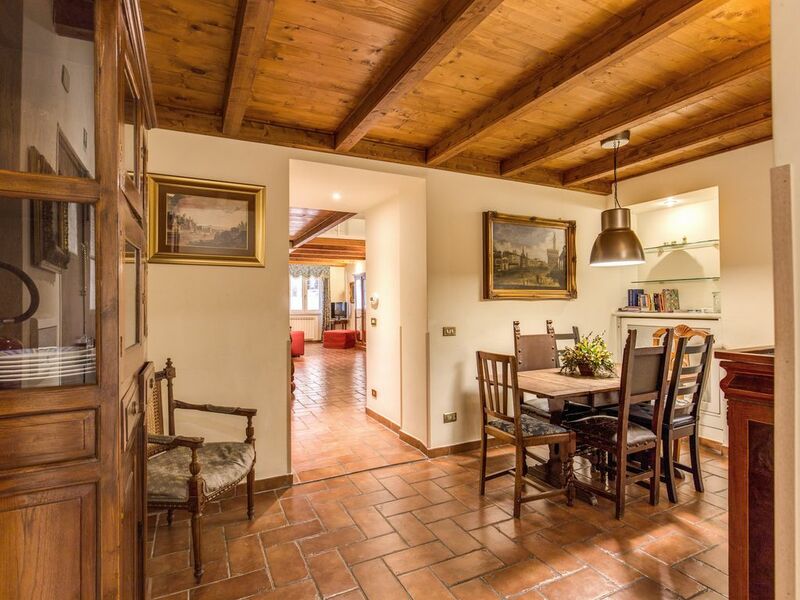 Otherwise location is ideal, central Rome, & in walking distance to many of the sights. Beds are comfortable, downstairs bathroom is good, taxi booking service is reliable. Apartment was warm and well-heated for winter, and has good air conditioning equipment in place for summer. We wished to be fair to the owner, depite our disappointment, and brought all of this to his attention in advance. He says he is working on all of these issues for future guests, and will be changing his cleaning agency. With some care and attention, this could be a very good place to stay, so - good luck! The customer was not housed in this apartment. Cet appartement est situé dans le quartier historique de centre, exactement dans la Via dei Cappellari, 85 (à quelques pas de Campo de Fiori, Piazza Navona, le Panthéon ... etc) dans l'un des endroits les plus historiques de Rome, l'appartement bénéficie d'une position stratégique à connaître pleinement la vraie nature de la Ville Eternelle et où vous pouvez rejoindre toutes les principales attractions touristiques de Rome par les pieds. Juste à côté de Campo dei Fiori. La place a marché d'un grand agriculteur pendant la journée et un grand peuple qui regardent lieu dans la nuit avec la vie nocturne. L'appartement est le long d'une rue calme avec des boutiques d'artisans locaux ouverts pendant la journée. De cet appartement, vous atteignez la voiture la cité du Vatican en 10 min à pied.